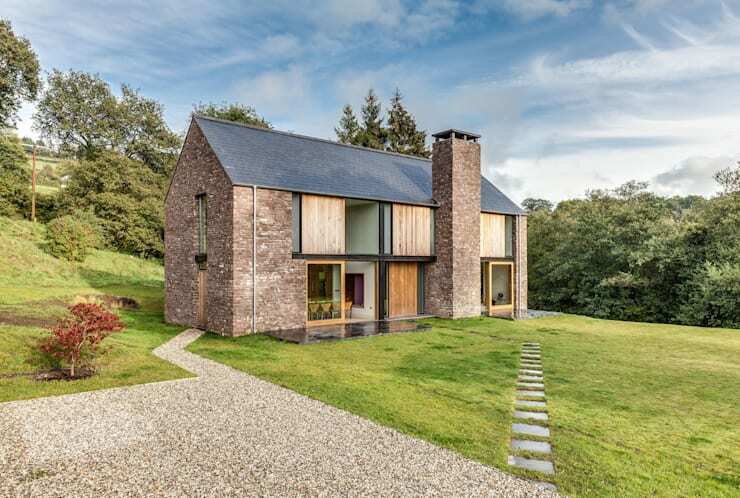 Today on homify 360°, we stumble across a modern piece of construction that very nearly resembles a fairytale cottage, tucked away in a lush, green setting. Created from the inspired minds of UK-based Hall + Bednarczyk Architects, this fresh little gem presents a contemporary mix between skill and ingenuity. Let’s start examining this beauty! With a soft stone structure that wonderfully fits in with the soft green palette of the environment surrounding it, the house stands proudly and inviting. 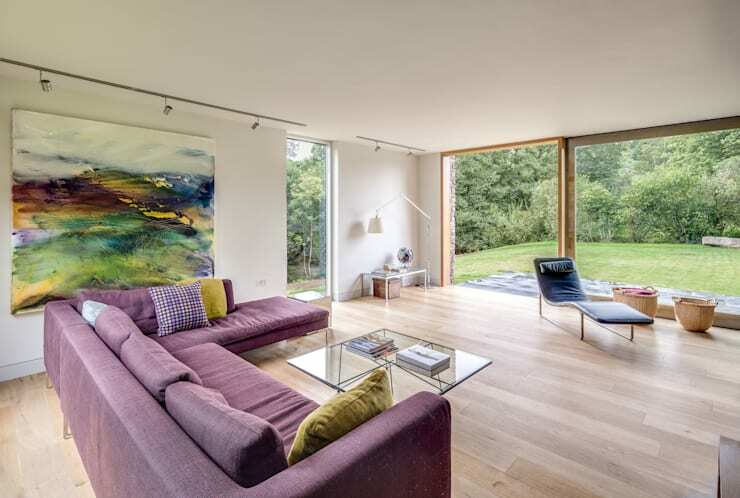 The big, clear glass glazing and open doors invite not only visitor, but also the sun’s rays and the views of nature to cross its threshold. The chimney towers over the grey roof – we can already imagine clouds of dark smoke billowing from it during winter time. A serene setting, away from the city’s hustle and bustle, makes this house a perfect location for some quiet recuperation. A clean, neat setting that is both gentle and inviting (isn’t that the main purpose of a living room?). Here is where family and friends can laugh and share in fun times, whether it involves listening to some background lounge music, or simply enjoying a bottle of wine. The decor shies away from bright colours, and instead soothes our minds with a soft palette of delicate violet, ocean blues, and nature green. The pale wooden floor invites any guest to walk around barefoot. The modern glass coffee table matches the calm mood of the crisp white walls, while the serene painting on the wall perfectly mirrors the soft hues of nature peering in from outside. Overall, a clean, fresh space that will be equally successful in either hosting a social gathering, or keeping you company during a quiet afternoon of reading and napping. Giant glass glazing makes the soft green exterior the perfect neighbour, while the tone of the wooden floor mirrors the emotion of a quiet beach. A tranquil blue softly fills the backdrop against the warm, inviting fireplace. The view of the burning wood adds that calming effect that we all know, especially during the crisp winter evenings. Even though minimal decor was used, the room still echoes a sense of welcoming friendliness. To complete this picture, just add yourself, along with your selection of friends/family! 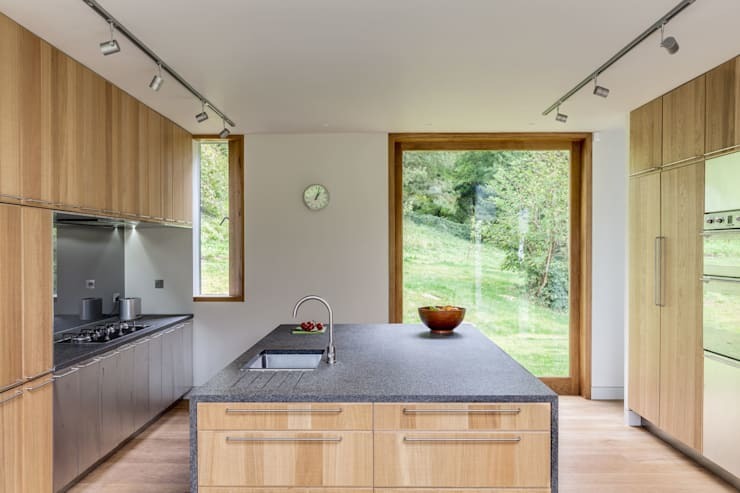 The clean, crisp aura of the interior continues into the kitchen, where a light wooden finishing (very similar to the tint of the floor) greets us. A multitude of drawers, cabinets and cupboards are available for any selection of pots and kitchen accessories, while the functional modern island, complete with its soft grey worktop, invites any social gathering around a fresh dish. Against the one wall we notice a clock – a very practical element to control the preparation time of meals and dishes, as one can very easily lose time socialising in this inviting space! 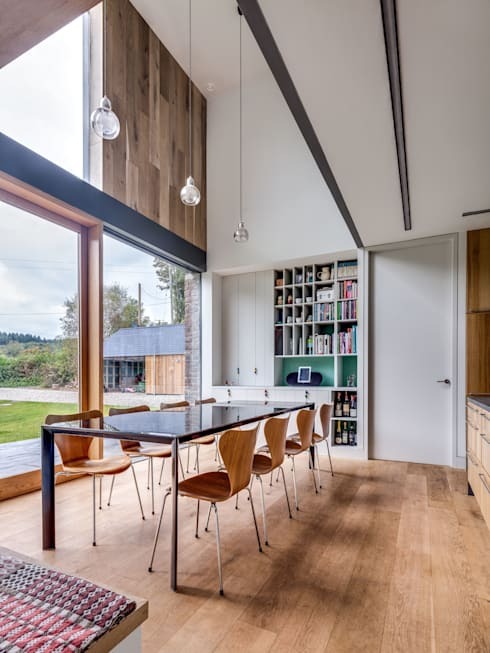 The dark dining table stands out from the pale wooden floor, while the dining chairs (finished with a slightly warmer version of the floor’s tone) are just begging to be filled with friendly characters, jabbering away while enjoying a delicious meal. And who will be joining us for dinner? The softly spoken tones of nature outside, visible through the glass glazing; the light fixtures dangling over our heads, adding a modern touch to the room; and the multitude of books, magazines, wine bottles and decor eyeing us from the wall case (supported by a soothing green wall backdrop). Opting for walls with more concrete and less glass, the bedroom seems to be the quiet space of the house, inviting anyone in for a peaceful, uninterrupted slumber. Going for a minimalist look, our specialists are using the strong dark wood of the bed to contrast with the white surroundings, finishing if off with a composition of patterned colours on the linen. Complete with a modern ceiling light that reflects a fluffy (yet chic) character, the bedroom exudes a feeling of positive energy, while remaining peaceful and calm. 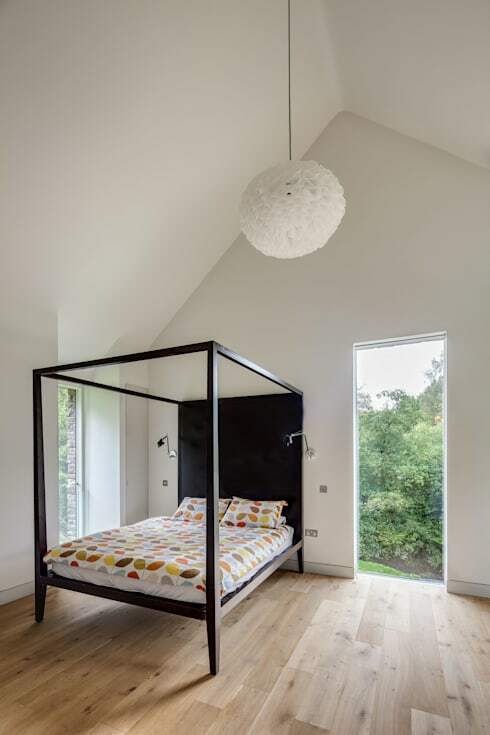 Why not take a look at some other bedroom ideas and tips? Those who want to cleanse in style need look no further than the bathroom. 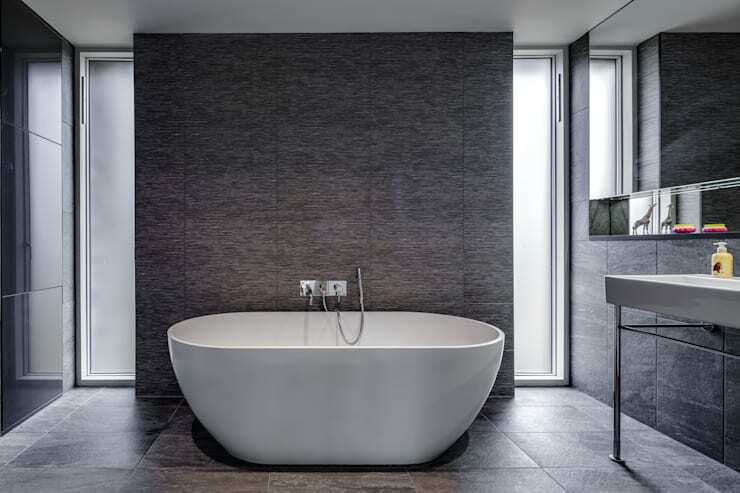 Encased by calming shades of grey (often used when creating distinctive modern designs), the bathroom is the epitome of modern spaces, with the crisp modern bathtub being the sole focus here. Contemporary designs all gather here: the modern porcelain sink; the simple-yet-stylish mirror; the tiled surfaces, the deep bathtub you can get lost in… if looking at this room is so visually stimulating, what must bathing (or simply flossing your teeth) in here feel like? For more ideas on the modern bathroom, let’s lend our eyes to Modern Bathroom Design.